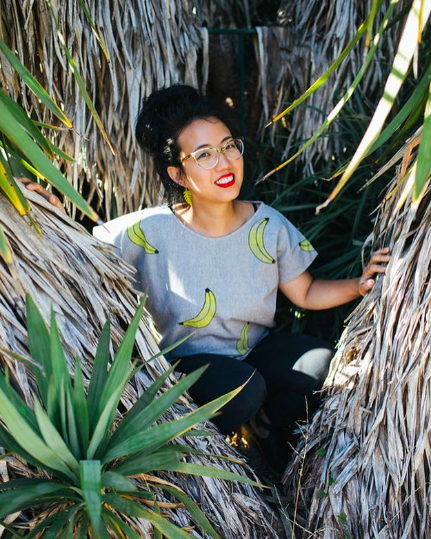 Jennie Lennick runs Jenny Lemons, a small-batch clothing company in San Francisco. Her line is playful, fun, colorful, and somehow subtly subversive. Each piece is printed by hand in San Fran and drafted, cut, and sewn, in limited edition runs in collaboration with small factories in San Francisco and Oakland, California. 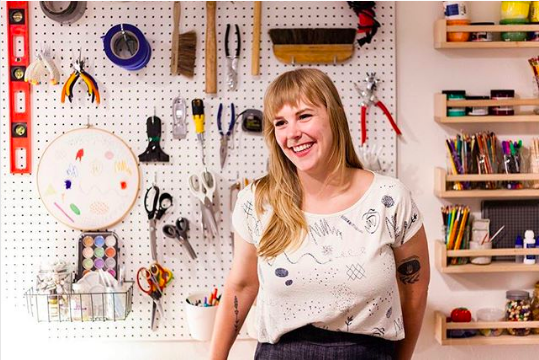 Recently, Jennie also opened an inspiring storefront, studio, and workshop space where she carries the work of other local artisans, offers DIY workshops, and sells a curated selection of art supplies. In this miniclass, Jennie is candid about the things many makers don’t talk about publicly -- money and finances, how she spends in a way that is aligned with her values even when she doesn’t have a lot of cash, hustling through lean times, and what to do when people hate what you make. I started Jenny Lemons when I was working in admin at a preschool and as a preschool teacher. So I did it in the evenings after work. I would sell stuff but it was always just getting back to zero, not making a profit. It was a hobby. And then I took a business planning class and wrote a business plan and that was great. But the most important thing for me was starting to learn about my financials and doing projections. For instance, if I sell 30 units a month through all my different sales channels, this is what my month would look like, this is what my quarter would look like, and this is how my year would pan out. And I’d think, “Oh sure, I can sell 30 things.” And if I do that, I’ll make this much profit. So actually sitting down and making that plan gave me the confidence to know that I could start, and quit my job, and throw my entire self into this project. My next step ended up being that I applied for and received a small crowdsourced loan from Kiva. Because I was a startup and my business was brand-new they allowed me to ask for $7K. At first, in my last year at my job, I was down to part-time because I was so busy doing craft fairs and doing team building events and workshops that I didn’t have time to come to my other jobs. That was the tipping point for me. Plus, my job had been paying my healthcare but they let me know that in the New Year they weren’t going to pay my healthcare anymore -- and that’s when it just stopped being worth it and I decided not to go back. 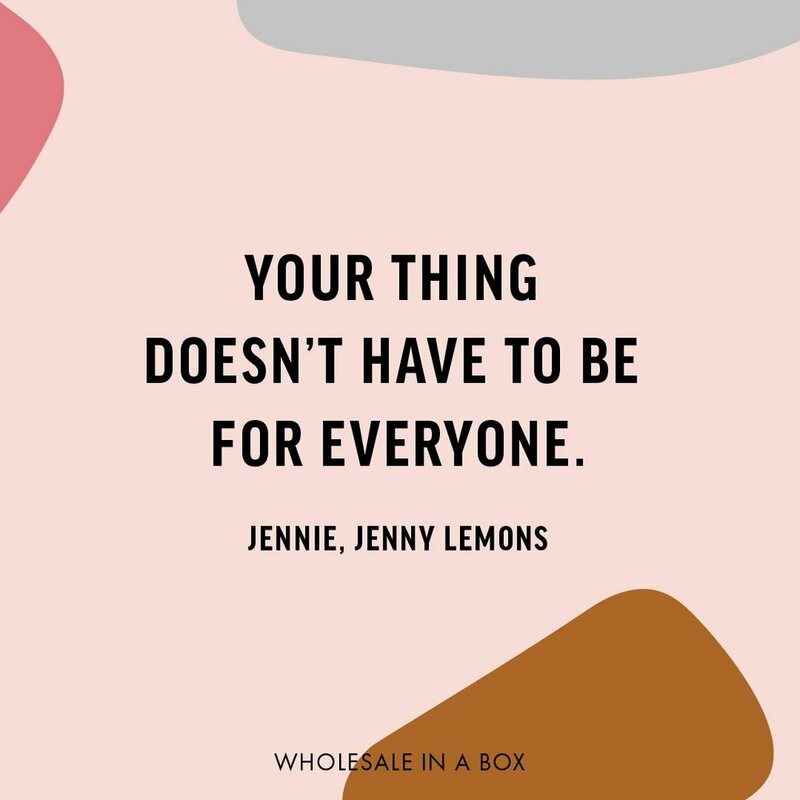 The truth is that when I made the leap from having a job to doing Jenny Lemons full-time, there was a gap -- I still really needed the money that had been coming from the job. But the loan created a bridge between having that job and ramping up into my projections. The truth is that you can keep going forever giving your business side hours and side money and putting all your spare money into it. But it takes me a really long time to make all of my products -- so I needed that time to make my products and develop products and do marketing. Now: I feel pretty good and like I understand the ebb and flow of my business. I just came out of the summer craft fair season. I expect to do a little better during the holidays but not much, because my stuff is really summery. You know, it reminds me of a friend of mine who started a personal training business and would share that if she ran out of toothpaste, she’d be so worried because if she buys toothpaste, she can’t buy something else. And I don’t feel that way anymore. I used to think, “What can I NOT get?” And now, I just get what I need for my business and feel OK about it. Honestly, money felt tightest BEFORE I started my business. Which is so crazy! But I was doing art shows, trying to do my business, working at the school... and at the end of the month I’d have no money in savings and $20 in my bank account. And I think it’s because I wasn’t doing the thing I was meant to be doing. And the second I said, “This is what I’m meant to be doing. I can put myself 100% behind it.” Then the floodgates opened and it made sense and it felt really authentic. I think mindset is a big part of it. When I was working at the school and was more hard up all the time, I would say, “The universe will provide.” And it would! There was never a time when I couldn’t pay off my credit card or couldn’t eat. Something always happened where I could pay my bills. I always joke about that saying, “Dress for the job you want, not the job you have.” And I try to do that. I’m as authentic as possible but I also internally and externally try to live into the job I want, not the job I have. And now I kind of have the job! But along the way, one thing that was important to me was being supportive of other small businesses. I would try to walk the talk. I would always buy from the farmers market. I’m responsible with my purchases. I like to support local businesses and wear other designers and buy stuff from my friends when their business is at the craft fair. And that shows that I’m truly invested in this thing. I read that book, The Life Changing Magic of Tidying Up. And that reminded me -- I don’t buy a lot of stuff but when I do, I’m really thoughtful. I cook at home a lot, that’s huge for me. And it’s good for my body and soul in addition to being good money-wise. I will say that we don’t travel as much as I wish we would. It’s such a huge expense. And I have friends who are going camping every weekend, but those trips really add up. And the truth is that a lot of it is money AND time but money and time go together. I don’t go out with my friends as much as I used to. Two years ago, we’d get drinks and dinner and it would be like $100. Now I never do that, never. Maybe a few times a year. There are those sacrifices. But a lot of it, I encapsulate into my morals. If I’m not buying independent, I buy used stuff. And you become friends with everybody when you go to craft markets. If you want to do well, especially in clothing, I always do vendor discounts, I do trades. And then what happens is, at a craft market, 20 vendors of 300 are wearing a Jenny Lemons top and that has sold so many shirts for me! I have a lot of financial routines -- I kind of get obsessed with it! I really enjoy doing my own books. I do it every 3 months. Not a good practice! Everyone should do them once a month or more! And then for my personal finances, I use Mint, which I love. It’s very cool because it shows you how much you’re spending on everything, like oh, “How much am I actually spending on coffee?” And then it creates budgets for you and tells you if you’re over or under. It’s not magic -- you really have to maintain it. I do that about once a week, just to see where I’m at and how my spending is doing. I also have a new app that I really love called Acorn. You attach it to your credit card and it rounds up your spending and puts it into an investment account for you. And I do have an accountant I work with once a year for my taxes. Together, he and I projected my quarterly taxes which I pay quarterly. I really recommend everyone set up automated transfers because that’s the only way you’re going to do it. Just set it and forget it! Every week, I put $200 in my savings account for taxes. Even if for that quarter, if it’s not even the full amount, I know I have a good chunk in savings. The one thing about quarterlies is that it’s an estimate and if you’re not able to pay the whole amount just pay something and you’ll figure it out at the end of the year. I also do personal savings. I set every week for personal savings and put $25 into savings, and in the middle of the month I put $200 aside. It’s much less that I save for personal savings, but it’s something. The thing about me is that I love apps and tools and I love education. I feel like, if there’s something that’s going to help me, please give it to me. Because I need expert advice. So I took a bookkeeping class. And in that, I realized that a credit card is basically like a loan that you have every month. So if I have to buy fabric, I just buy it. I don’t buy more than I can fit in my storage space or more than I can sell. The thing is, I buy dead stock and remnants, so if I don’t buy it when I see it, it will be gone. I think - if I pay for it now, the middle of the month, I have until the end of the statement balance plus more, so I basically have a month-and-half to pay it off. Cash is king for your business. If you can get someone to bill you rather than paying up front, that’s always better. For instance, people buy stuff from Uline. Have them bill you - you have 30 days to pay it off, plus you can pay that with a credit card. You give yourself like two months to pay it off. I pay my credit card off every month. And I only pay the statement balance. One important thing is that I just don’t buy stuff I don’t need. And maybe from doing my business long enough, I have a sense of that. I’ve been doing this five years. If I don’t need it, I don’t get it. Or if I end up with something I don’t need or don’t like, I return it. The biggest investment I made in my business was that business planning class. At the time, I got a scholarship to go because I had no money. I paid $600 it felt like so much. I was basically on food stamps. They had reduced the fee from $1000 to $600 but I still had to break it up into a payment plan. But now with this program, I have free financial advising, free marketing coaches, I can participate in marketing stuff after the program. I’m so glad I did that. I remember originally it was cheaper but then they raised their price. I was actually crying because I knew I needed to do it but I was so worried that I couldn’t afford it. For instance, sometimes makers don’t have the confidence to just make a list of all the things you have to do and go out there and do them. Or someone will go to a craft fair and they sell one thing for $20 and the person next to them sells $6,000 worth of products. They give up instead of taking it as feedback for what people like and don’t like. If you believe in what you’re doing, just do it and then figure out the way to do it as you go. It makes me really sad when I see people get so down when people don’t respond instantly to their work the way they want them to. My former self would have been crushed. I would have felt like, “Oh no, it’s all so ugly and everyone hates it.” But now I felt like, “Ok, screw you, lady. These other 20 people want to buy some shirts. Get out of their way.” Your thing doesn’t have to be for everyone. Or maybe you’re selling at the wrong craft fair. Or maybe you’re showing it to the wrong group or in the wrong way. But honestly, I try to think, “What is the good thing that happened from this experience?” For instance, at that terrible farmers market, I showed my products to people who wouldn’t have been able to see them. And then, my friend came by and bought a bunch of little cards for his girlfriend he was going through a rough patch with… and now they’re married!” So I learn from it, improve as I go, but I also don’t worry about it too much. I also try to learn from the crowds at different places. For instance at The American Craft Council Show - that show is a much older crowd - they bought out all the dresses - and no one ever buys dresses! Or I’ll notice that no one is buying my embroideries, maybe I should stop making those altogether. So the next time you’re there, bring what people want. Giving workshops has been been incredible for my business. I teach through many channels. I do lessons in my studio. I teach very small - 6-8 people maximum - so really little. I also teach at a DIY school in town and at boutiques, especially ones that I wholesale at. They know you and they want to bring in business. And I also do corporate events and festivals like Levi or the Monterrey Pop Festival. What I teach has really evolved. I started teaching workshops at an artist’s residency. I taught in exchange for affordable rent in San Francisco. I started with that and then over the years of doing it, I evolved. I used to just teach what I did - sewing and block printing. But I started to veer from that because the things you do all day, are sometimes not fun things to do at night. So I do things that are parallel -- macrame, simple weaving, sashiko. Things that are fun for me, not a lot of materials, and not a ton of prep because I’m really busy. In terms of deciding a fee, usually the host of the workshop will have a set fee schedule. If not, I look at the market and see what I can charge. I like to try to get $40 per person not including materials. In terms of securing workshops, now that I’m better-known, they’re coming to me. But I have pitched - I did one at Gravel and Gold that I pitched and they said yes. Or I pitched a DIY school that was looking for a kids teacher. I hit them up and they never wrote me back. But then years later, they came back and now the ball is rolling. And Instagram. I know my products are expensive and I am committed to keeping my products’ pricing as low as I can. I have a spreadsheet that I use that is based on the number of units I can sell per month, operating expenses, COGS, hours of labor... and it spits out a number. I double it for wholesale, double again for retail. But then I adjust for the market and what seems realistic. If you have some prices that are higher - those are your signature prices. But then have some lower-priced pieces like tea towels that can get you into shops and can create brand awareness. Numbers really settle my soul. Because if 1+1 = 2, I don’t have to worry. There is so much I do to just hustle and make things work. Anytime there is a free consultant, I ask for it. Or: every city has an SBDC. Subscribe to their newsletters -- I got a free intern for 6 weeks and she worked 20 hours per week for me and I paid nothing and she got paid from the city. People are so shocked but there are all these things that are available that people just don’t pay attention to. Or I’ll attend free workshops. I went to a free workshop on Instagram at Adobe. As long as it makes sense -- do it. It’s really just about using resources when they are offered. I guess I’m annoying - I always have business cards on me at all times. If I am in a store that I like, I get the buyer’s card and leave mine. It’s important to balance being open… and also being positive. A lot of people aren’t like me and won’t openly talk about money and how they’re doing. I certainly do. But then on the other hand, being negative in public and having a bad attitude when you’re supposed to be representing your business is a bad decision. For instance, other makers will be very loudly negative if their sales aren’t great at a fair. Or on Instagram or on your website, focusing a lot on the negative. It really turns people off and I see it all the time. Your social media for your business is for your business. Everything you do with your business account should have a singular goal. It’s not that you shouldn’t be genuine, but your social media is for your business and to grow it and everything you put out into the world should be to protect your business and to grow your business. I made a list of Jenny Lemons morals and values that are specifically fair trade, but maybe not talking about political subjects. Which is hard because I’m a very political person, but I don’t talk about touchy political subjects or religion. Because it’s not good for my business! It’s really hard for me to talk about because it’s really emotional for me. I have an assistant who helps me 1-2 days per week and who is also a small business owner who is getting started. And then my partner helps me with some things from time to time. I’m also looking into hiring an actual employee. And there are programs here that cover up to $5K for a business’s first employee. And I’m really committed to working with artists and small biz owners. In terms of how much to pay, it depends on the job and also on minimum wage. I wish I could pay what Google pays people. But minimum wage in San Francisco is $14, which is really high, so I start people at $15 because I don’t want to be minimum wage, but it’s also what I can afford and what I think is fair. Keeping my prices reasonable has been holding me back from hiring people because most of my income, I reinvest into my business. I pay myself a bare minimum and everything else goes into my business. But you do have to be fair and lawful. Some laws are there to protect people. So if you’re going to hire someone as an independent contractor, make sure that they really are setting their own hours and doing the other things that apply to independent contractors. When I was in art school, I had a teacher tell me, “If you want to be an artist, you have to make up your mind and do it every day. And it has to be the only thing I want to do.” And that statement has stuck with me. This is a whole lot of work, so I check in with myself, “Is this the only thing I want to do?” It’s unique to be passionate enough about something to actually do it all the time. If you wake up in the morning and you’re dreading it, then reassess. Jennie’s approach to her business, art, money, and values is really inspiring. She manages to “walk the talk” in such incredible ways -- and shares a variety of very concrete tips to boot. Get a little obsessed with your financials. Jennie is very much an artist, but she’s also found ways of delving into her finances that feel interesting, fun, and supportive. She knows that if the money works out, she can relax into knowing that things are fine -- and that releases her artistically. Spend in ways that are aligned with your values. Despite not always having a lot of money, Jennie has chosen to buy nothing if she can’t buy something that’s aligned with her values. And she’s seen this prioritization of buying from artists and makers help her business. Make financial sacrifices to grow your business. You can’t always invest in your business AND have all the things and experiences you might want to have. Sometimes, your business has to be your priority. Invest in tools and education. Tools, courses, and education (as long as they’re the right ones) can be transformative in your trajectory. 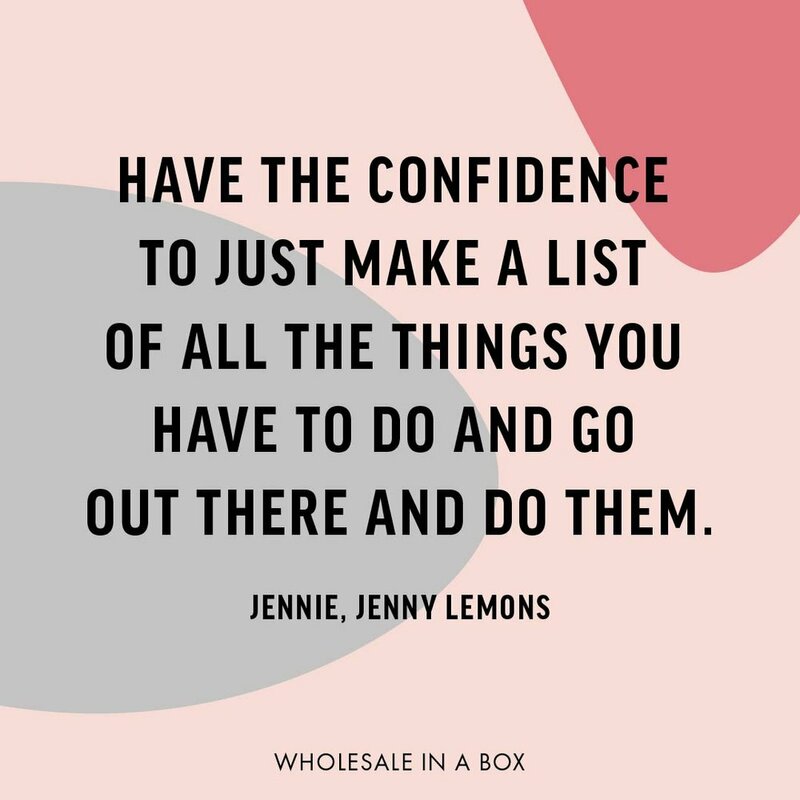 As Jennie says, ultimately, running a successful business boils down to having the confidence to just take steps forward. Remember that what you make doesn’t have to be for everyone. Try to focus on ANYTHING positive that may have come from your time. Incorporate what you learned about what specific groups of people are buying or what folks tend to love of your line in general. Evolve the roster of events you attend based on what you’ve seen actually be successful for you. Consider workshops as another revenue source. It’s something you can pitch to shops or other locations that can bring in some money but also be a fun and connective experience for you. Especially relating to education or experts. Jennie has accessed thousands of dollars of free education and support just by noticing things when they were available. Use your business social media to help your business. Yes, be genuine. But also be thoughtful about whether a given post will help your business grow. Be careful about following business-related laws. For instance, following laws that restrict which workers can be classified as independent contractors does protect people… and protects you from problems down the road. Pricing is a balancing act. Jennie uses a costs-based approach to calculate a starting price… but then adjusts that based on what she knows is reasonable in the marketplace.